LYNNVILLE – The Lynnville UMC in the LaMoine River District recently reflected on nearly 200 years of Methodism with an Early Methodism Celebration Nov. 14. 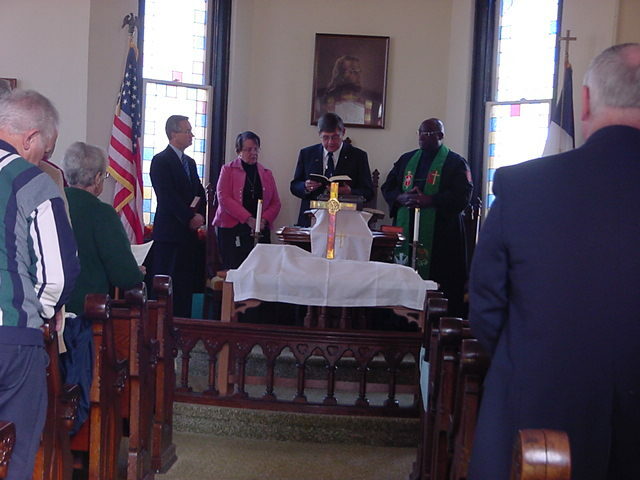 Bishop Gregory V. Palmer, resident bishop, was on hand to deliver the morning message and also celebrate Holy Communion, assisted by LaMoine River District Superintendent Randy Robinson, church pastor Nancy Wood and former Lynnwood pastor and retired IGRC clergy Phil Icenogle. Methodism was introduced into the area now known as Lynnville (Linville) by early fur traders that followed the Illinois River and then the creeks inland. Also many of militia brought their families and they lived in blockhouses and forts in the area. The settlers actually made their homes on what is now known as Allinson’s Mound as this gave them a vantage point for safety reasons as there were Indians living in this area. Gradually they moved few miles south to build a gristmill on Walnut Creek even before the village was platted. As was typical of the Methodist movement in England, these early Methodists met for many years in small groups in their homes. After the end of the War of 1812, many more people came from England especially from Yorkshire to settle this fertile farm ground and live out their dream. A common building was built in the town square and was used by not only the Methodists but also Disciples of Christ. It also served as the school and community center. In 1833, Barton Stone established the Disciples of Christ Church and the Methodists bought a small building that had been a Baptist church. When the small building no longer was adequate, a church was built in 1843. The Rev. Peter Cartwright who was a prominent circuit rider in this area dedicated this edifice. This building was used for many years until their membership outgrew the space. And then five women decided that a new building should be built and they went into action. First they formed a Ladies Aid Society, which held wild game dinners and ice cream socials. Some of the women even went out with horse and buggy and solicited funds for this project. When sufficient funds were raised, the small brick church was demolished and the present one erected. On Sunday, June 26, 1892, the church was dedicated and Rev. Horace Reed of Danville delivered the sermon. It is interesting to note than in a prominent place in the program was a blank form of a promissory note, intimating that raising funds was an important part of the program. Throughout the years the Methodist Church has had a presence in the community with their musical groups, election day duck dinners, burgoos, vacation Bible schools, community activities and their women’s group. On Nov. 14, those in attendance celebrated the many years of Methodism in this small village—from the fur traders, militia families and to the brave settlers who endured many hardships to come to this area. Their hope, faith and courage as well as those who have followed were celebrated.